Two years ago, the library switched from a completely fixed schedule to a hybrid model. Students in preschool and kindergarten currently come at a scheduled time each week. First and second grade come for a fifteen-minute weekly check out. All other instruction is incorporated into the first- and second-grade curriculum often in a co-teaching capacity. As you can imagine this was a new way of looking at instruction for most people involved (including me). Although many of my colleagues recognized the potential this of this model, they were not aware of my curriculum objectives or the possible types of projects or lessons we could collaborate on. Additionally, they were also really, really busy most of the time. The question I had to ask myself was, “What can I do to help make this successful?” I always prefer a proactive rather than reactive approach. 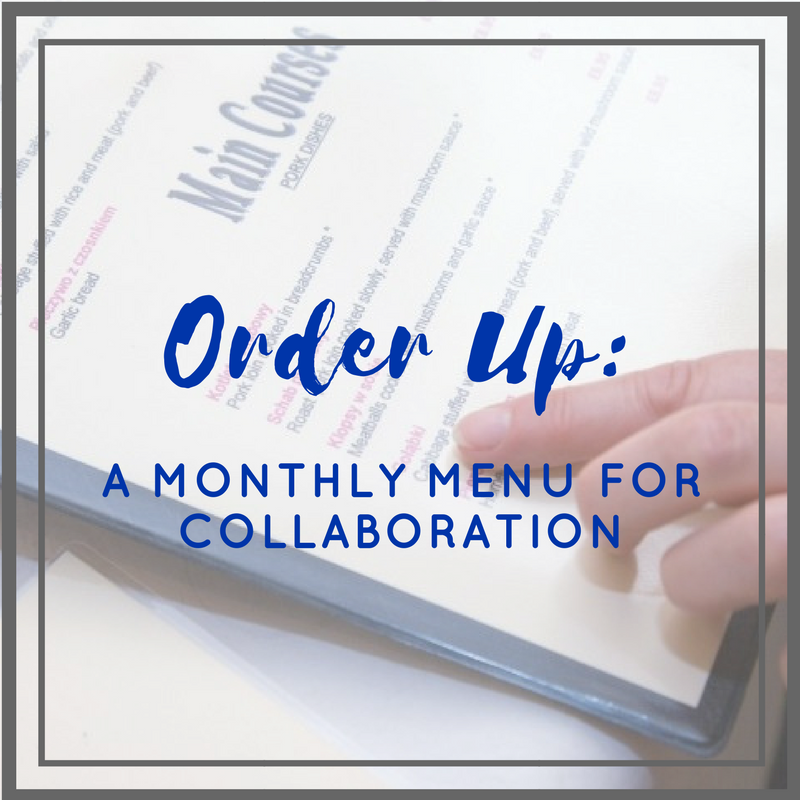 To help with the transition, I started making a monthly menu of options. 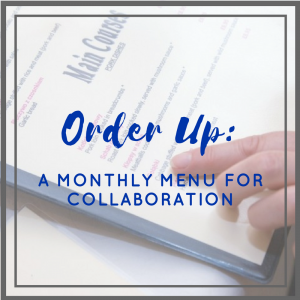 The menu contains three to five lessons or projects that mix the library and classroom curriculum. Sometimes these lessons are one and done. Other times, they are a part of a larger project or unit. I introduced the menu at the beginning of the school year during a team meeting. It was explained that teachers could choose all of the options, one of the options, or none of the options from the list. The items are all “a la carte” as we say. This introduction allowed me to then email and/or put a printed menu in the teacher’s mailboxes in the future. This allows teachers to review it on their own time. In addition, they do not feel pressured to complete any of the items on the list. Curriculum Connections – This is where I list my standards as well as their curriculum objectives. This is more for me to make sure that I am meeting all the library objectives throughout the year. It has led to great discussions about common language and where our curriculum overlaps. Lesson Idea – I give a basic write up of the idea. The goal is not to give the entire lesson plan, but more just a brief synopsis. This way there is room for discussion and we can truly make the lesson or project work for the students. No one person owns it, but it is a collaborative effort. Time – I try my best to list how long I think it will take. This way teachers have a sense of how big it would be. This is always an estimate but provides a starting point. Overall, the menus have helped immensely to develop collaborative relationships as well as raise awareness of the library curriculum. It has forced me to really know the curriculum in first and second grade so I can provide lessons that are not “add-ons,” but truly integrated. This leaves fewer skills taught in isolation. Making it so everybody wins! 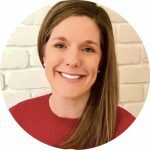 ‹ Your 2018 AASL Social Media Superstars! How do you handle long-term planning when some teachers take advantage of the lessons on your menus and some don’t? I’m working on building co-teaching relationships, and I’m ending up with some of my students knowing (for example) what an encyclopedia is, some of my students knowing what a bibliography is, and some students just coming in for book checkout. It’s making it hard for next year and beyond when half the class will need a brief review on that skill and half the class will need an introduction. Any suggestions? This has been a concern for me as well. Since this is only the second year on a flexible schedule I have not really seen the impact quite yet. Many of the skills that I include in my menus repeat throughout the year. So if a teacher does not choose one of the items at one point in the year it will probably be taught in another time with a different menu option. I don’t know if that helps but has been my workaround.